Ready to bounce? Receive (2) $25 gift vouchers for only $25! A 50% savings. Use it for any activity at Adrenaline (Columbia SC location only). 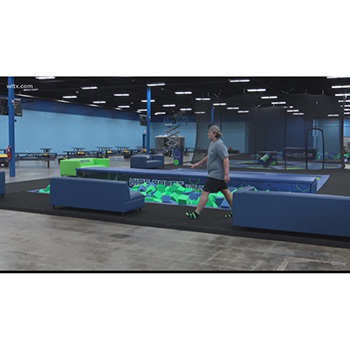 If you’re looking for a day of adventure and excitement, look no further than Columbia’s Adrenaline Entertainment Center’s indoor trampoline park! Our parks are so much more than just a traditional trampoline park. Adrenaline offers high-energy fun through a wide variety of heart pounding activities like, basketball, dodgeball, Rock-climbing, Wipeout, Foam pits, battle beams, and more! To add some mental Adrenaline, or for those who are looking lower heart rate fun, Adrenaline has Escape Rooms* that are both challenging and unique. Looking for a cool down or some hi-tech fun? Adrenaline’s Virtual Reality Rooms offer the most up to date technology with a variety of virtual fun. These thrilling activities are sure to get your heart rate going and put a smile on your face, all while creating long-lasting memories for you and your friends. Our event-hosting offers you the opportunity to hold unforgettable birthday parties for your kids, or a team-building experience unlike anything you’ve ever seen before. So whether you’re young or old, check out Adrenaline Entertainment Centers today! Any unused portion of the gift voucher, will be credited to an Adrenaline gift card for future use. MUST PRINT A PAPER COPY OF VOUCHER TO REDEEM. No Mobile passes will be accepted at register.